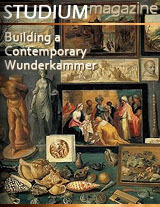 Key ingredients of most classic wunderkammer were art and sculpture, the beautiful creative work by the hands of man. Aside from the familiar mediums of canvas and marble, the raised impressions in metal in the form of coins is an impressive and inspiring art form that still remains a powerful statement after oils fade in color and statues chip and crumble. The end of the 19th Century through the beginning of the 20th was a time of fine artistry that graced many coins of the world, particularly the large crown-sized silver coins that circulated in trade around the globe. Stately images of royalty leading nations into more modern times were there, along with delicately rendered symbols of the power and patriotism these nations expressed as subtle reminders at each transaction. The sculptors behind these works of art were masters at their craft, and had to be, for they were the invisible diplomats whose competence reflected upon the country for which they carefully chizeled. One of the most beautiful renderings of a monarch to ever grace a coin was that of an elderly Queen Victoria posing in tiara and veil on the powerful crown of England. The work of sculptor, Thomas Brock, the bust of the Queen resided on all denominations beginning in 1893, as well as on military medals of the time. Thomas Brock was later recognized for completing the Victoria Memorial in front of Buckingham Palace, where upon its formal unveiling in 1911, he was immediately knighted by a moved King George V.
St. George mounted on a steed, slaying a dragon was the impressive work of Benedetto Pistrucci, an Italian engraver employed at the Royal Mint beginning in 1816. Still in use on British coinage to this day, the work was Pistrucci's idea to symbolize Britain's victory over Napoleon at Waterloo a year earlier. The majestic "Caballito" (little horse) peso of Mexico was designed by the French artist Charles Pillet, and was coined to commemorate the Independence Centenary, which is commonly known as "Grito de Dolores" (Cry of Delores), honoring the first revolt against the Spanish in 1810. The obverse shows "Freedom" represented by a feminine figure on horseback, holding a laurel branch of peace with her right hand and a torch to lead the way in her left. It is a striking rendition that reflects this important period of high art on large coin of the realm. These are but two examples of impressive art through sculpture appearing on coinage from the Late Victorian era. Their inclusion in a cabinet of curiosities is a fitting destination for the often unrecognized masters of this small medallic art form. Although the examples within this wunderkammer are nearing perfection in grade, one can obtain an attractive example of a Caballito peso for around US$50, and a Victorian crown for approximately US$30. High quality examples of each may run US$1,000.